Welcome to CSRA’s drop-in-place experiential social media for beauty salons, spas and fitness studios. It raises the bar by deepening your connection to clients and prospects through unusual online interactions. It’s breakthrough because it attracts your most profitable clientèle and reduces churn. Most beauty and wellness businesses don’t realize they can change the game by meeting clients’ growing desire for exceptional online experiences to complement and extend their experiences onsite. It uses a proprietary methodology that’s been tested in ten years of client work. This page shows how it works. 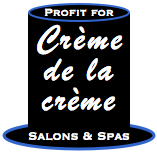 “Crème de la Crème” refers to the fact that 20% of clients generate 80% of profits at most beauty salons, spas and fitness studios. 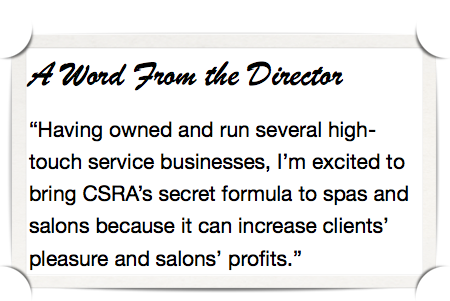 CSRA focuses on growing that customer base by helping clients get what they want when they visit your salon or spa, whether for business, pleasure, romance, or friends and family outings. Since we interact online in unusual ways, everyone sees and your business builds. We also offer experiential social media services to luxury retailers, restaurants and other local businesses. This page can help you in two ways: if we’ve met and you know enough about the Crème de la Crème service to start exploring, you can book a complimentary meeting by using the form under Get started below. If you’d like to Learn more about the service, review its FAQ in the right column, which is updated based on my conversations with salon and spa owners, directors and managers. The first step is setting up an hour-long meeting at the salon or elsewhere. At the meeting, you can ask any questions you want about Crème de la Crème service, other services, CSRA or anything else. I’ll also explain in more detail how the service works and ask you some basic questions about your business goals and your Crème de la Crème customers. This enables me to help you pick experiential services to try. Since you can change services from one month to the next, your first choice is only the starting point. Once you see the interaction and engagement we initiate with your Crème de la Crème clients, you can decide whether you want more or less. Begin by recommending three meeting times that are best for you. Please list your best time first, followed by second best, etc. Your contact information and preference: 1) name/title; 2) phone; 3) email; 4) any other contact you prefer. Mine is here. Once you hit the “Show Results” button, the form will show your answers and notify me. I’ll be in touch to confirm one of your slots (usually) or suggest alternates (rarely). If you have any questions or want to tell me about your situation in another way, please contact me or share here. Do you want to go behind the curtain? Although Crème de la Crème experiential social media is offered as a simple service, it rests on rigorous insight, methods and tools. These have deep roots in my experience as a management consultant advising owners on business strategy, technology disruption and transformation. I invite you to access my thought leadership on local business and large-scale retail to understand how the rules are changing for salons, spas and fitness studios. These articles help demystify things about the business environment you probably feel but may not fully grasp. Most important, they can give you unusual insight, so you can use disruption to your advantage. Few owners of salons, spas and fitness studios realize the new advantages they have in extending their unique personal touch online. Experiential social media can grow and deepen your selling radius. What is drop-in-place? What are your services and prices? Drop-in-place refers to Crème de la Crème’s unique design, which you can change or turn on or off, month to month, even though it’s a very sophisticated service. Here is our list of service levels and prices. Unlike CSRA’s consulting services, Crème de la Crème is offered in simple monthly levels of service. We’re already doing social media, so what will this do for us that’s different? CSRA developed experiential social media for salons and spas based on thousands of hours of client work in which teams studied behavior in digital social venues. I developed “the recipe” for salons because, as the owner of several small businesses, I’ve known the frustration of high marketing costs, and I appreciate the need to build business profitably. Large salons’ corporate groups often practice social media on behalf of their salons, and this can be a very efficient way to generate awareness using their Facebook, Twitter and Pinterest accounts. It’s also very complementary to experiential social media, which is most active on third party sites where clients are. Each salon has its unique character and Crème de la Crème customers. We discover and stimulate the most unique, compelling connections between each salon and its clients. We don’t do social media since it hasn’t produced business results in other salons I know, so why should we do this? Most businesses use social media like a digital sandwich board. Social media puts on its makeup and walks busy streets (Facebook, Twitter) at lunchtime or rush hour. Some salons drive more business with promotions, but this business is less profitable. It’s inefficient. Experiential social media for salons and spas takes a completely different approach. Over the last eight years, I’ve developed a method that fuses sociology, software development, psychology and digital tools that makes it very efficient to interact with people who have very specific motivations for visiting salons. I work with salons to map their most profitable services to these clients, so we aim to increase visits from the most profitable clients, not all clients. How long does it take to start producing results? Each niche of your Crème de la Crème has its own character, and many other factors determine the answer to this question. For example, some niches are heavy online users of social media while others are not. Some require more attention before they start loving you back. During our analysis, we’ll guide your expectations for each niche based on its behavior. Another variable is how much experiential social media you do; a slow drip will take longer to get results. Expect different results for different niches. In most cases, it takes a few months to interact enough so people start trusting that you really care (it’s not just marketing), but once they feel your commitment for a while, results increase geometrically. It’s also important to avoid coming on too strong, too; CSRA will recommend an appropriate frequency for each digital social venue. How can you increase business from such specific client niches? CSRA’s teams intensely study your Crème de la Crème clients, and we quickly learn about their motivations for and experiences with salon visits, and we test our learning by interacting with your Crème de la Crème. We learn what stimulates them and what doesn’t. We learn what’s most valuable to them. How do you decide where to engage our Crème de la Crème? It’s a secret recipe, but I can tell you that the most efficient venues are rarely the most popular to general audiences (i.e. Facebook, Twitter). We define the optimal venues by finding the ones that have the highest portion of conversations that’s uniquely relevant to your Crème de la Crème. So what do you do in these “digital social venues”? We focus on people’s motivations behind salon visits, so we not only engage them with the pleasure of the salon experience; we also help them be more successful when they are wanting to feel good, planning corporate events, weddings, romance or special gatherings with friends. They soon associate you with being useful, relevant and caring, as well as pleasurable. It’s an unbeatable combination! Each experiential service comes with some hours of unbilled time, some at the salon, spa, or studio, in which we observe your clients and how you serve them. This gives us insights into how you give people the most pleasure and add the most “value” relevant to their motivations. By ethnographic observation, we learn surprising things you’d never think to say and we’d never think to ask. We use these insights to engage your Crème de la Crème in distinctive ways. CSRA refers to me, Christopher S. Rollyson, and my global network of experts and specialists in design, management consulting, software development, sociology, culture and many other disciplines. I create teams from this large reservoir of people, so I get who is perfectly suited for your initiative, not only staffers that happen to be available at that time. Do you have a question that’s not answered here? Ask it in comments (“Leave a reply”) below. Or contact me.